We have been vacationing on various beaches around the world for over 30 years and The Island Princess has become our favorite vacation spot for our family. For many years we have dreamed of owning a beach condo and sharing it with others. We invite you to relax in our second floor, beach front retreat and enjoy the emerald waters and sugar white sands. FLORIDA’S BEST KEPT SECRET . 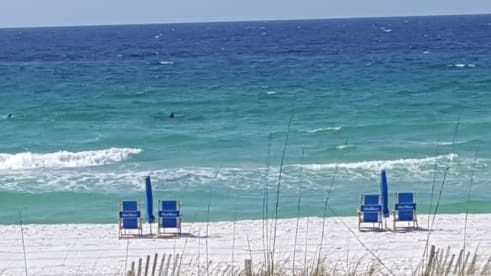 . . Good Morning America named the Emerald Coast “One of the Top Ten Most Beautiful Places in America” and it is regularly named by USA Today, Frommers and Southern Living as a best beach & family destination. Located on Florida’s World Famous Emerald Coast, Okaloosa Island is only 6 miles away from the attractions of Destin but miles away from Destin’s crowds. The Island Princess offers an intimate beachfront setting with special amenities such as a heated pool, hot tub and fitness room. The complex is known for it's attention to details and lush landscaping. Preferred West End with Convenient Second Floor Location:Our 3 bedroom unit sits at the end of the complex with expansive views to both the east and the west with a unique view of the sunsets to the west. The West End is quiet and nicely located near the outdoor grill area and fitness room. You can take the elevator and arrive just steps from your front door or simply take the stairs to second floor.